Bolivia Rising: "Morales Is a Guide in a Long Period of Change"
"Morales Is a Guide in a Long Period of Change"
LA PAZ, Apr 14, 2010 (IPS) - The resurgence of the thinking of Aymara "amautas" or shamans about nature, the collective welfare of society and the defence of life is now a political project in Bolivia led by left-wing President Evo Morales. In the view of Pascual Pachaguaya, a 54-year-old amauta, Morales' unprecedented victories - he took nearly 54 percent of the vote when first elected in December 2005, and was reelected with over 64 percent in December 2009 - marked the start of a lengthy period of change called "Pachakuti". Pachaguaya, whose skin is weather-beaten from the unforgiving sun of the Andean highlands, wears a broad smile and chews coca leaves as he talks to IPS in his small house in the city of El Alto, a vast working-class suburb that overlooks La Paz. He is one of the spiritual guides of the 51-year-old president, an Aymara Indian who is a former leader of the country's coca farmers. The amauta belongs to a group of survivors of several centuries of persecution and even selective killings of Aymara priests and shamans. The interview takes places at a table covered with a woven Andean cloth where the wise man scatters coca leaves to read the future. On the walls are pictures of the Kalasasaya temple in the ancient pre-Incan city of Tiwanaku near the shores of Lake Titicaca, 70 km southeast of La Paz. On Jan. 21, the day before Morales began his second term, Pachaguaya led a traditional indigenous spiritual ceremony at the ruins of Tiwanaku, where the president was once again proclaimed Apu Mallku or "supreme leader" of the Aymara. The amauta says he is a "representative" of Pachamama or "mother earth", and was chosen after being hit by lightning, which left a mark on his shoulder, and witnessing, on another occasion, an explosion followed by intense flames - two events he describes as the "cosmic force" and the source of his wisdom. 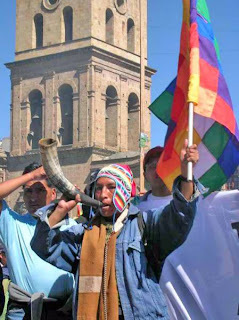 Q: How did the Jan. 21 ceremony arise, and what meaning does it have in the Andean indigenous people's worldview? A: Pachamama entrusted me to bring new things (ceremonial rites) out of Taypi Kala (the original name of Tiwanaku that means "the stone at the centre of the world"), because although they look like old, dead ruins, the roots of our culture are alive there. The cycles of life are described in the sacred writings on the Puerta del Sol (Gate of the Sun), and we hold a ritual for people from the Andes highlands and the Amazon jungle, because no one should be excluded because of their race or skin colour. Everything is harmony, and no one can be isolated. We gave our brother Evo positive energy for him to govern and have good relations with humanity. Q: According to the Aymara culture, when does the cycle of change begin? A: Ï participated in the return of the Bennett Monolith from La Paz to Tiwanaku in 2002, a time when the climate was in agony, the fields were plagued by drought and there was famine because the potatoes that grew were small and even the livestock was dying. Under drizzling rain, we took the monolith back to Tiwanaku, and since then, food production has grown and we have been eating potatoes that are so big only one fits in your two hands. Q: Who personified the defence of nature, and where do these ideas come from? A: The Mallku (Felipe Quispe, an Aymara indigenous leader) appeared and said: "Why don't we govern ourselves? The 'k'aras' (white elites) dismantled our country, sold our mines, our water and our oil and natural gas; the only thing they didn't do was sell us," he said. We made offerings to the earth, and it appears to be listening to us. We think the (Feb. 19, 2002) storm over La Paz was the response to humanity, and that moment is when the doors opened up for us. Q: How long will this cycle last, according to Aymara belief? A: This cycle will be a long one, of well-being, and we calculate that by the third generation we will be doing well. We were born as a "wara wara" (star) and we light up the world. In 2008, in the town of Charazani [260 km west of La Paz] we took part in a spiritual circle of the planet's wise elders. They came from Asia, Europe and the rest of Latin America, and they joined in this movement that arose from our ancestors in Tiwanaku, a centre of energy and ancestral wisdom. Brother Evo has faced death five times, which means he would not have led the government, but Pacha (the earth) helped us and gave him strength to fight the enemy. With that help, we are going to free all of humanity. Q: And will the k'aras be allowed to take part in that culture? A: We are not their enemies; we want peace, tranquillity and the freedom to live in unity; we are just opposed to looting and theft [of natural resources by lighter-skinned elites in indigenous territory] because they are crimes. If they generate work, their activities are welcome, but we must focus on major projects to pull people out of poverty, and to bring about the change we must free ourselves of the impurities of politics. The people must generate their own change, which is not Evo - he is just a guide.